You know I believe the key to career success is experimenting. And that risks are worth taking if you want to live a life that truly makes you happy. And that to accomplish your career goals, you’ve gotta surround yourself with go-getters. 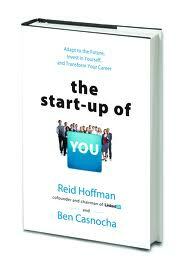 So you probably won’t be surprised to hear that I picked up a book about how you should treat your career like a startup: The Start-Up of You, by Reid Hoffman (co-founder of LinkedIn) and Ben Casnocha, whose blog I recently began reading. The premise of this read is that your career is in permanent beta, so you have to invest in yourself and apply an entrepreneurial mindset if you want to thrive. To really achieve, you have to keep learning. And you won’t learn by planning. You’ll only learn by acting, through trial and error. “If you’re unsure what your first, or even your second, step should be, pick a first step with high option value, meaning that it could lead to a broad range of options,” Hoffman writes. In other words, get going on something, even if you’re not sure exactly what you want to to. When it comes to benefiting from your network, you’re more likely to hear about new opportunities from people you don’t know that well. That’s because if a close friend already knows about an open position, you probably do, too. This is why it’s so important to get outside your inner circle of knowledge, to meet new people and keep in touch with them. Social networking fits well into this approach, because it makes it easier to stay in touch with people you don’t know all that well. Smart, right? We know you can jump-start new relationships by offering to help another person, but what should you offer them? “The secret behind stellar small gifts is that it’s something you can uniquely provide,” Hoffman explains. So what can you provide that someone else couldn’t? Maybe an important introduction or connection, knowledge or training, information, etc. So you don’t feel guilty spending money on networking opportunities, consider creating an “interesting people fund.” This is investing in yourself in the true sense of the word! Use that money to pay for coffee meetings, lunches, social events where you’ll meet new people, even plane tickets that will help you create and foster relationships that could help you down the road. I’m curious: anyone doing this already? While this book wasn’t a game-changer for me — perhaps because I already approach careers with an entrepreneurial mindset — it did help me think differently about the points I’ve outlined above. And I consider any book that gets gears turning in my head a win. Oh, and the book has a cool website, so it’s worth checking out if you’re hoping to have your own book on shelves at some point. What are you doing this week to take your career to the next level? Love that idea of not keeping options open. I was thinking about that a few weeks back. I realized that when you keep your options too open you scatter your focus and as a result the quality of the work you’re doing in a particular area decreases. Great review, the point of “To real­ly achieve, you have to keep learn­ing. And you won’t learn by plan­ning. You’ll only learn by act­ing, through trial and error.” really speaks to me, I always try to over plan things. I think a lot of us tend to do that, Rene 🙂 You’re not alone! Please stop recommending this book 😛 I bought it thanks to you, but have been so busy with work that I’m only 20% through. I’m really enjoying it so it’s making me stabby. Agree with the philosophy. It’s one that I’ve accidentally adopted since I’m not really employable in the traditional sense and it’s worked out well in the long run – if you take a long term approach. Also, reading books on startups helps with the entrepreneurial/freelance mindset – can recommend some. You are a perfect example of someone who’s doing this well, Jade! Love your point about committing to a plan of action instead of keeping all options open. When you frame it like this, it makes more sense. About the “interesting people fund”…all I can say is that at the beginning of my career when I had zero discretionary income, THE ONLY TIME I ate out was with other people. Even now, I cook all my food, except when I’m out with people. Overall, I thank you for writing this. I have to share it with someone who I fear isn’t taking the “first step”. I feel like it’s right there….but she’s so unsure.